uncharted | audio | London-based record label and all round good guys. Well what a time of it we’ve been having here at UA towers… to say we’ve been plagued by manufacturing gremlins would be an understatement, but now, finally, at last, we’re ready to announce the eagerly anticipated release of Ukkonen’s fantastic debut album. “The Isolated Rhythms of…” has been garnering intense critical acclaim from music press across the world – and who could blame them? This really is a record to write home about. Five pieces of just about the freshest electronic music to ever grace ears, our mysterious man from the Arctic has done it again, following his two fantastic EP’s over the last year or so. Speaking of which, if you’re still not a proud owner of those, may we recommend you get your skates on as both are now very nearly sold out and they won’t be repressed. Back to the matter in hand though, the album is now available to buy digitally from just about everywhere and the vinyl will shortly follow suit. Did we mention manufacturing problems? Well we’ve been through four (count ’em) sets of lacquers, three pressing plants and several facepalms but it looks like we’ve finally overcome. And yes those really are individually hand-painted sleeves packaging the double vinyl version. As usual you can order direct via our shop, where you’ll also get a free instant download in whatever format takes your fancy. Hear it in full below, and read copious praise and place your order here. And there’s not one, not two, but three jaw-dropping sets he’s produced for the good people at No Pain In Pop, Underlying Form and mnmlssgs. You need all of these in your life. Finally, the one and only Ukkonen interview, courtesy of the excellent Sonic Router, is available for your perusal here. Kone-R performed the closing set (with Stayhome) at Ginglik‘s 10th birthday party. A great time was had by all and we’d like to congratulate Tam & Col on their achievement. Legends!! Kone-R also reached a couple of milestones of his own – a whole year doing shows on the fantastic Future Music web radio station, continuing fortnightly on wednesdays. Also he’s now been twenty (yes, twenty) years on the turntables in general. Scary stuff. 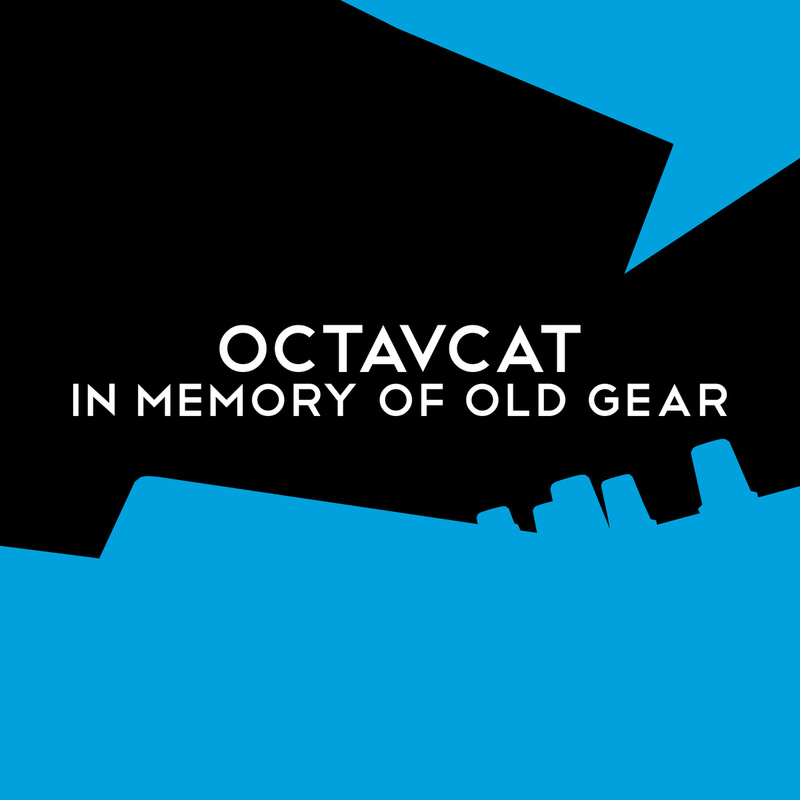 Octavcat have a rather marvellous track picked up by Warp, Bleep and Soundcloud for this exclusive compilation. Apparently Warp, Bleep and Soundcloud know a thing or two about music. The genius Cursor Miner got his Masters degree in Digital Music Processing – congrats! Neil Wells, who some of you will remember as Line, released a cracking EP under his new moniker, Forever Sound. You need this. Regolith have a new one dropping too, check a sampler and preorder here. Geological!! Finally Posthuman also drop a newie, this one has a rather nice remix package too. Check them both out at Acroplane. Thanks to everyone for their support recently, it’s been immense! The mysterious Arctic producer known only as Ukkonen, returns to vinyl with a brand new five track EP as a warm-up for his forthcoming double album on Uncharted Audio. Following last years ‘Erriapo’ 12”, which was charted by the likes of Agoria and left critics comparing his unique non-linear grooves to the likes of Gas, The Sight Below, Mark E, Aphex Twin, Brian Eno, Carl Craig, Mika Vainio and Isolee, here are five more masterpieces from his repertoire. Already being courted by other labels (with a compilation appearance mooted for No Pain In Pop after they invited him to remix man-of-the-moment Patten), and turning heads with his jaw-dropping ‘reimaginings’ of classic Detroit techno (completely removed from its 4/4 context) for the likes of Underlying Form, this reclusive producer is the only one to watch this year. You can stream the release in full and place your order here. Don’t forget the UA shop is the only place you can get a free download in the format of your choice as soon as you place your order! It will also be available soon in the ‘download only’ format. Next up we’d like to thank everyone who came down to Ginglik for our 10th birthday party earlier this month. It was amazing!! Serious props to all the performers, helpers, liggers, guests etc who made sure it went off with a bang. And a special mention to Geoff Cowart for the press coverage and Emma Gutteridge for the photography. See a selection of her snaps from the night here. As 2011 draws to a close we look forward to next year which will kick off with new releases from Ukkonen, who has recently remixed man of the moment Patten. We’d like to thank everyone for their continued support, particularly in these difficult times – we can’t do it without you. Finally, don’t forget you can catch Kone-R‘s fortnightly web radio show on the excellent Future Music – the next shows are on November 30th and December 14th and 28th. Previous shows are all archived here. Thanks again and have a great festive period! In other hot news, it’s been 10 years since Uncharted came into being. Naturally we’re very pleased to have reached such a milestone and would like to thank everyone who’s supported us down the years – we can’t do it without you. To celebrate, we’re throwing a party at Ginglik in Shepherds Bush, a venue that has been pivotal to the label for a long time now. It’s on November 5th and as well as a host of live and DJ performances from acts on the label, we have a very special guest in the form of Oliver Ho – another bastion of West London’s electronic underground. Full details on the ‘live’ page. Another gig we have to mention, also in Shepherds Bush, is the forthcoming Oxjam event on October 29th. Label boss Kone-R will be dj’ing at the Raving Buddha, but the event is spread across six local venues and goes on all day. Early bird wristbands are available, along with more info, here. Naturally it’s all for a good cause, so well worth giving your support! More releases are just around the corner so hold tight! There’s only 200 copies of these and they are selling fast – (Phonica have already had stock twice and both times it sold out in just 24 hours, with Andy Weatherall among the purchasers) so don’t be one of those left with a sad face when the Ukkonen album drops on Uncharted later this year, as these tracks aren’t on it! Regolith perform live at the Roundhouse on sunday 15th of May. Free admission. Details here. Regolith onstage at 5pm. Kone-R’s debut performance at Fabric for EPM was a roaring success. Hear his set here. Cursor Miner’s “Requires Attention” continues to do top business, with celebrity fans rushing to buy it. Check it here. UA head honcho and resident DJ extraordinaire will break his Fabric duck on 26/02/11. This is a digital-only release and it’s available from all good digital vendors now, including our fab new online store (where you can listen to the whole thing in full). If you like the black stuff (we do), there’s also still a few copies of the album available on limited edition hand-numbered vinyl. If you’re the kind of person that likes their music in bits, Cursor Miner Requires Attention is now available directly from the Uncharted Audio shop in a variety of digital formats including mp3 and FLAC. To celebrate, here’s the latest in our series of slightly ridiculous adverts. This one highlights some of the Celebrity VIP Special Guest Stars featured on Requires Attention. Notes: Seed Records 10th Birthday Party with Posthuman, Antoni Maiovvi, 8Bitch, Sleeps in Oysters, The Dagger Brothers and Seed DJs. 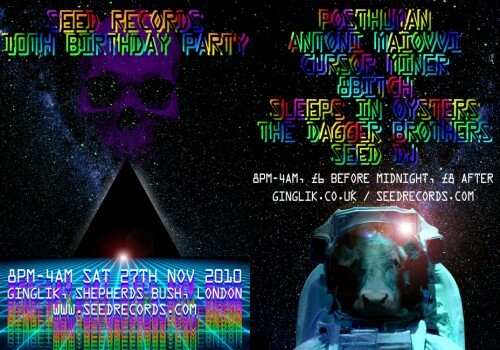 From a North London bar, to warehouse spaces in Dalston, abandoned tube stations, prisons, renovated cinemas and beyond… Exactly 10 years & 2 days after the first ever “Seed” party…five live acts and two DJs showcasing the last decade of Seed Records – past & present.